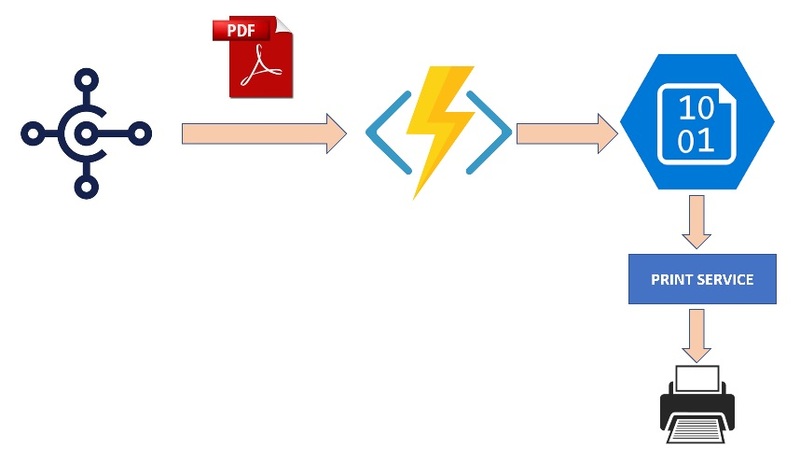 This seems to be one of the hottest “problems” when using Dynamics 365 Business Central SaaS: actually you cannot directly print a document on a printer, but you need to open the PDF file and then print from the browser. This could be ok for documents or for other not so repetitive tasks, but it could be a problem on scenarios like warehouse or production and so on, where you need to send to a printer a big amount of documents. Unfortunately there’s no an “out of the box” solution for that and Microsoft at the moment has no plans for implementing that feature quite soon. So, possible solutions for this hot topic? I don’t have THE ANSWER to this question, but only some ideas to share. Solution 1: using a commercial tool called Printnode. This is a remote printing service for web applications that expose an HTTPS API that you can call for creating print jobs via HTTP calls. You need to sign up for the service and install a local client. To create a print job with PrintNode, you have to create a POST request to the printjobs endpoint. More informations here. Solution 2: using Google Cloud Print service. Google Cloud Print is a service that permits you to add your WiFi-enabled printers under your Google accounts and from here you can send print jobs from the web. Search for your printer and click Register. Now you can use your printer from the web. You need to authenticate yourself to Google Cloud Print and then you can use the APIs to send print jobs. More informations can be found here. For this solution, I’m using the exact steps I’ll describe in the next section (Solution 3). The step 3 is the only different. Fo this solution, I have a service that reads the document to print from the storage and then creates a Google Cloud Print job. The main problem with this solution is the token expiration time. A token expires after 60 minutes and you need to recreate a new token after that time. The function receives a JSON request as input (Http POST), reads the content and extract the data on it (the base64 string of the document, the file name, type and extension). Then it calls a method (UploadBlobAsync) for uploading the file to the Azure Storage (I normally use a dedicated container called printerqueue. See a container as a sort of “directory” inside your Blob Storage account). Code for this method is omitted here (very simple). As last step, on the client side (internal network) we have a Windows Service that every N seconds polls the Azure Blob Storage (printerqueue container) for checking if there are documents to print. If so, it reads the document and sends it to the printer. It downloads the file from the Azure Storage and saves them to a local repository. Then, for every file it calls the SendToPrinter function that performs the printing. The document is printed on the default printer associated to the server. This solution is absolutely not perfect and it can be improved for sure. The scope is here was only to give you ideas and tips on how to implement your own direct printing solution. As said before, I think that Microsoft needs to work on this topic with an high priority. Printing in an ERP system is a top requested feature and it could be a SaaS-killer reasonfor many scenarios if not available. I don’t think this is so difficult to do for Microsoft. They could implement a service that must be installed locally that receives the document stream from Dynamics 365 Business Central and print it on a local printer. This function could be native on every report when a user clicks on “Print directly”.